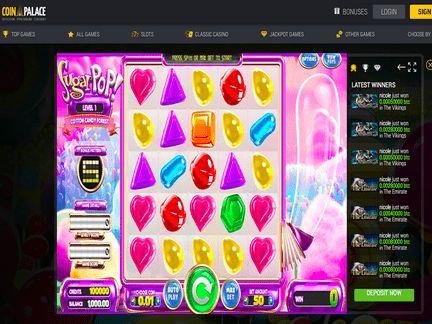 The main page of Coin Palace Casino looks very professional. Several things are highlighted right off the bat. The fact that a player can deposit money in 17 different currencies is emphasized. There is also an emphasis on the types of games that are available on the site. The sign-up button is easy to spot. Therefore, the visiting player can immediately take part in various promotional deals. Some of the deals deserve to be mentioned. The casino has prepared a 100 % bonus on the player's first deposit. It is willing to grant such a match to all visitors who make the appropriate contribution. As good as the deal appears, the website has hidden other promotions. They are not available for general viewing. Therefore, the comparison with other websites does not result in a positive evaluation for the casino. After all, the other casino website have a much richer promotional deal section. Even if other deals do exist, the fact that they are hidden does not help the casino to reach more players. On the first deposit bonus, the 100 % bonus is enabled as soon as the deposit is dropped. The max deposit is 1 BTC. For the second deposit bonus, a 50 % bonus is activated as soon as the deposit is made. In order to cash out, the players must wager the bonuses thirty-five times. Otherwise, the cash-out won't take place. Since the Coin Palace is a bitcoin casino, the bets are also listed in bitcoins. However, the player can choose to make a deposit in Euros and US Dollars. On the payment form, the players pay with cubits. This is a large platform for deposit and withdrawal processing. OBT, Sofort and OK Pay are the supported payment methods. The standard credit cards are not offered here. The online casino is popular with bitcoin users from around the world. But the unique casino is especially popular among European visitors. The following languages are now supported on the site; English, German, Russian and Chinese. Unfortunately, the players from the United States are not allowed to play on the site at this point in time. However, the players from other English-speaking countries are more than welcome to participate in the games. In the casino, the European Roulette has become the magnet for traffic. The game attracts the most visitors. However, the website also offers other games that are also worth checking out such as the Starter Slots. Baccarat, Blackjack, Hi -Lo, Video Poker, Poker & Other Slots. The game offer is not very large. This may be seen as a peculiar weakness of the casino. In some ways, the criticism would be justified. 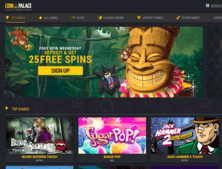 Many online casinos now offer a huge amount of games. This website pales in comparison. At the same time, the games that are available on the site have consistently high quality whereas it is possible to find a lot of bad games at the venues with a whole lot more games. No complaints have been registered on public forums. While it is wise to remain somewhat cautious, it is a good sign. The players have not noticed any problems with the way in which money and prize-giveaways are handled by the casino staff. The customer support is available via live chat. It is also possible to e-mail the staff. Instant cashouts are promised to all winning players. There is also a strong emphasis on security and privacy on the site. The proper encryption methods have been used to secure the player's details. Interestingly enough, the casino does not provide any details concerning the obtained license, or whether it has been obtained at all. This is a very bad sign. While it could be the case that this information was overlooked, it is vital to know such things. Therefore, the Coin Palace Casino does not leave a good impression on that level. I think that the lack of information concerning licensing is a major flaw of the casino. All the positive things that can be said about the venue can be easily dismissed when such crucial information is withheld. Therefore, I cannot provide a full endorsement despite the lack of negative reviews or complaints. Although the game selection is rather limited, I believe that the appearing titles can be relied upon as a source of great entertainment! I was also happy to see the endorsement of several languages, which makes the casino more attractive to international players. I believe that the casino needs to provide more details about how it is regulated. If such information will be published down the road, the casino still stands a chance to present something unique in the online casino world.